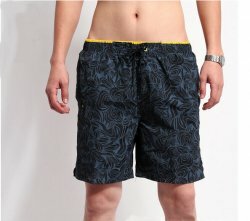 End of stock: Great swim trunks for summer water adventures. Tropical blue dark pattern on navy background. Side pockets, velcro back pocket. Comes with inner brief. Choose from one of 5 packing inserts to be added to your trunks. Waist has yellow trim for a color pop. Elastic waistband with string tie. Above knee 16" length. For sizing, pay attention to inches on sizes. Poly/Spandex blend, quick dry. -Floater pouch. pouch, sewn at top of waistband, top loading for packer, set your packer within pouch, free swinging. - Snuggler pouch, pouch, sewn at 3 sides, top and two sides, keeps packer from moving. Top loading. - Drop C ring , interior harness, 1.25", hangs from V shape elastic, packer is against your skin. With or without a ball cage for added security.